The first Iranian-developed self-propelled artillery system was called the 122 mm Thunder-1. The 155 mm Thunder-2 is a new design and was first shown in public carried on a low loader in late 1997, together with the 122 mm Thunder-1. A detailed analysis of photographs of Thunder-2 shows it has a similar layout to the United Defense M109A1 155 mm/39 calibre Self-Propelled Howitzer (SPH) that has been in service with the Iranian Army for some years. 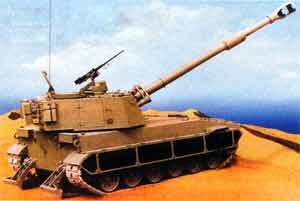 In the Spring of 2002, the Iranian Defence Industries Organization (DIO), Armour Industries Group, released full details of the Raad-2 155 mm/39 calibre self-propelled gun-howitzer (SP/GH). This has been in quantity production and service for several years with the Iranian Army. It has also been referred to as the Thunder 2 self-propelled artillery system and was first seen in public in 1997. In developing the Raad-2 series of 155 mm SP/GH, Iran has used components from some of its other armoured vehicle programmes with the obvious logistic and training advantages. The rubber tyred road wheels of the Raad-2 are from the locally produced Russian T-72 series Main Battle Tank (MBT) as is the V-84MS V-12 diesel engine, while the SPAT 1200 transmission is used in the locally upgraded Russian-designed T-54/T-55 MBT. 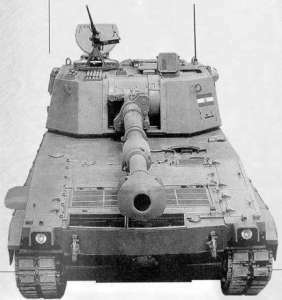 Prior to the fall of the Shah of Iran, it is understood, 440 M109/M109A1s were supplied by the United States. The 155 mm/39 calibre ordnance of the Thunder-2 is manufactured by the Hadid facility of the Iranian Defence Industries Organization (DIO) which also builds a wide range of other tank and artillery barrels as well as towed artillery systems, rocket launchers and ground-based mortar systems. In appearance, the 155 mm/39 calibre ordnance of the Thunder 2, which has the local designation of the 155 mm Cannon HM44, appears almost identical to that of the 155 mm/39 calibre M185 ordnance used in the M09A1. It is fitted with a double baffle muzzle break, fume extractor, screw breech mechanism, hydropneumatic recuperator and a hydraulic recoil brake. Firing standard 155 mm M107 high-explosive projectiles, a maximum range of 18.1 km can be achieved but, with the enhanced projectiles, longer ranges can be achieved. Maximum stated rate of fire is 4 rds/min. Weapon evaluation is from -3 to +75°. When deployed in the firing position two spades are lowered either side of the hull rear of Thunder-2 to provide a more stable firing platform. Although the general layout of the Thunder-2 is similar to the United Defense 155 mm M109A1 it does feature a new turret and chassis. The former has hatches in the sides and two roof hatches with a 12.7 mm M2 machine gun mounted externally on the cupola on the right side of the turret roof. The indirect fire sight is located under an armoured hood on the left side of the turret roof, just in front of another roof hatch. The Thunder-2 chassis is of a new design with the driver seated front left and the power pack to the right. The driver has a single-piece hatch cover that opens to the right in front of which are three periscopes for forward observation. The air inlet/outlet louvers are in the forward part of the hull with the exhaust output on the right side, provided with a cowl. There also appear to be stowage boxes integrated into the upper part of the hull towards the front of the vehicle. Suspension is probably of the torsion bar type with each side having six dual rubber tyred road wheels with the drive sprocket at the front and the idler at the rear. There are also return rollers and the upper part track is covered by a rubber skirt to help keep dust down. The road wheels of the Thunder-2 appear to be from the Russian T-72 Main Battle Tank (MBT) which has been manufactured under licence in Iran for some years. In the lower part of the hull rear is a large door for ammunition re-supply purposes. The Hadid facility also manufactures a wide range of other barrels for armoured fighting vehicles and artillery applications including the 122 mm barrels for armoured fighting vehicle and artillery applications including the 122 mm barrel for the Thunder 1 (HM51 and the 125 mm barrel for the T-72 series MBT (HM50). Thunder-2 was tested early in 1997 when Iran claimed that it had a range of more than 30 km, a maximum rate of fire of 5 rds/min and a maximum road speed of up to 70 km/h. Iranian sources state that both the 122 mm Thunder-1 and 152 mm Thunder-2 are fitted with a laser range-finder, semi-automatic loading system and a state-of-the-art fire-control unit. The laser range-finder could be for direct fire target engagements. For some years Iran has been self-sufficient in many natures of artillery ammunition including 122 mm and 155 mm. This is made by the Ammunition Industries Division of the Defence Industries Organisation (DIO). Natures of 155 mm ammunition manufactured include standard 155 mm HE, smoke and illuminating, with a maximum range of 15 km, and HE base bleed, with a maximum range of 34 km, depending on the weapon/calibre length used. The actual 122 mm and 155 mm ordnance of the two new weapons is probably made by the Armament Industries Division of the DIO which has for some years been making the standard 122 mm D-30 towed artillery system. The chassis of the two weapons are probably made by the Vehicle and Equipment Industries Division of the DIO and may be powered by an air-cooled diesel. The development of the Thunder-1 and Thunder-2 self-propelled artillery systems is yet another important step by Iran towards becoming self-sufficient in many key weapon systems. This is powered by a model 5TDF water-cooled diesel engine developing 700 hp that gives a power-to-weight ratio of 19.4 hp/tonne. This engine was developed and manufactured in the Ukraine and was originally fitted in the T-64 series MBT and is a member of a complete family of very compact diesel engines. Maximum road speed of the Raad-2M is quoted as 60 km/h with a maximum road range of 450 km. Externally the Raad-2M is distinguishable from the Raad-2 as the former has a large oblong exhaust outlet mounted on the right side of the chassis with a distinctive grill above. Iran is also now making a 155 mm/45 calibre barrel (the HM47L) but at this stage it is not known as to whether this is installed in a new Iranian towed or SP artillery system or it is a replacement barrel for its currently deployed 155 mm/45 towed artillery systems which have been in service for many years. Iran is also now producing barrels that are chrome plated to extend their lives.